In my plaintiff’s personal injury practice, I have learned that tractor-trailers traveling through Atlanta can do a lot of damage in a motor vehicle accident, including catastrophic injury, such as paralysis, or death. Georgia trucking accidents would be reduced if the Georgia Legislature passed a law creating trucks only lanes. 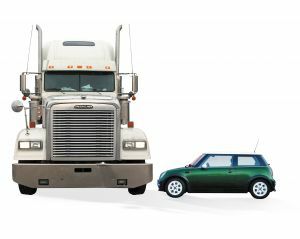 After handling so many of these cases in my practice, I have made it my personal preference and habit to stay out of the way of all tractor-trailers, including not traveling in the same lanes as tractor-trailers, if at all possible. A small passenger vehicle stands little chance if hit by a tractor-trailer. Yet I concede that tractor-trailers are the backbone of American commerce, and a necessary way for goods to be moved across Georgia and across the United States. This does not take away the fact, however, that they can be extremely dangerous on Georgia roads to the motoring public of Georgia. The Georgia Department of Transportation is considering building “trucks-only” lanes on the state’s interstate highways and major roads. The Georgia DOT says it is studying putting in new lanes, not taking over existing lanes on the Interstates. DOT estimates that 940 million tons of freight was moved across Georgia highways in 2004, but in less than 30 years that number is expected to double. Interestingly, truckers questioned about the proposal think it might help them with their work by eliminating passenger vehicles in their lanes. I think it would be beneficial from a safety standpoint to Georgia citizens. Others in Georgia agree. The Georgia Department of Transportation will hold public meetings later this month to get input on their trucks only lane proposal. Those meetings will be held in Dalton, Savannah, Macon, and Kennesaw. The study is expected to be completed later this year.